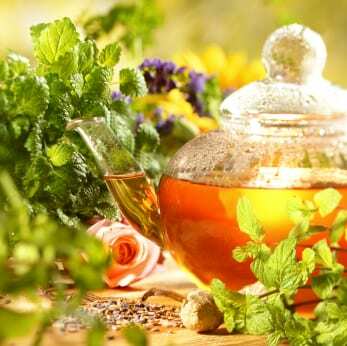 Herbal and spice teas are taking the country by storm and no wonder – they are healthful, delicious, and touted as a cure for a variety of ailments! At the top of the list is Chai tea. Chai tea is made mostly of spices, while herbal teas are made mainly of herbal leaves (or flowers, in which case they are called tisanes). Combine all of the ingredients except the ginger in a non-stick ungreased heavy skillet. Over low to medium heat, toast the spices for about 3 minutes, until fragrant. Remove from heat. Add the ginger and stir until blended. Let cool. Once cooled, pound everything briefly, just enough to crush the spices coarsely. I like to do this with a mortar and pestle, but you can do it in a spice/coffee grinder, or put the spices in plastic bag and pound with a mallet or rolling pin or the bottom of a pan. Put into and store in airtight container for up to 4 months. Tip: Give with a set of Oriental tea mugs without handles. BREWING CHAI TEA: Combine 1 cup milk with about 2 teaspoons Chai mix and brown sugar or honey to taste (start with 1 teaspoon). You could also use a sugar substitute. Simmer and then turn off heat. Cover and let steep for 10 minutes while you brew a pot of Assam or Darjeeling (these are Indian teas – you could also use regular tea) using 2 cups boiling water and 2 teaspoons or 2 bags of tea. Reheat the spiced milk if necessary and strain it into 2 large teacups. Pour in the hot tea and enjoy! HEALTH ASPECTS OF CHAI TEA: Cardamom is said to be an anti-spasmodic and a digestive stimulant. Cloves; an antiseptic and good for gastric discomfort. Cinnamon is pungent and warming and is good for the digestion. It is also said to be anti-spasmodic and antiseptic. Ginger helps the circulation, is an expectorant, and is very calming to the stomach. Star Anise tastes a bit like licorice and is a stimulant and diuretic, and is thought to relieve sore throats.